A Logic Puzzle Mystery, Brought to Life! Halloween might be over and done with, but there’s still plenty of spooky puzzling to be found if you know where to look. For instance, if you’re looking for a game that takes the traditional logic puzzle in a new direction, let’s talk about Return of the Obra Dinn, a PC game that has received some rave reviews recently. 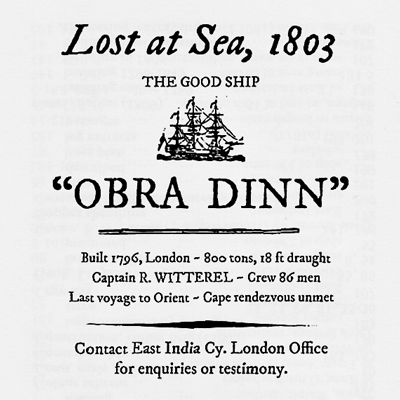 In 1802, the merchant ship “Obra Dinn” set out from London for the Orient with over 200 tons of trade goods. Six months later it hadn’t met its rendezvous point at the Cape of Good Hope and was declared lost at sea. Early this morning of October 14th, 1807, the Obra Dinn drifted into port with sails damaged and no visible crew. As insurance adjustor for the East India Company’s London Office, find means to board the ship and recover the Crew Muster Roll book for assessment. With that intense historical premise to work with, you know you’re in for a few scares and some sinister storytelling. So the game centers around a first-person perspective of this ship as you explore what happened to the crew. You’re armed with two items: a book that contains the ship’s manifest and other documents, and a pocketwatch that, when worn near a corpse, magically reveals what happened at the moment of the character’s death. 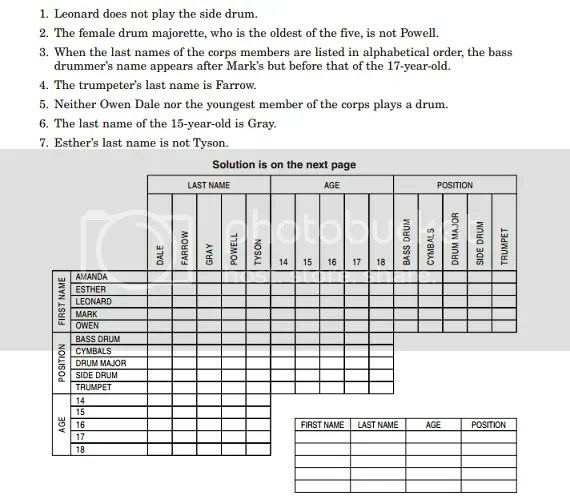 The book works like a standard logic problem’s puzzle grid, where you can fill in the information you know and deduce, say, the last names of five people in a marching band, their ages, and what instrument they play. 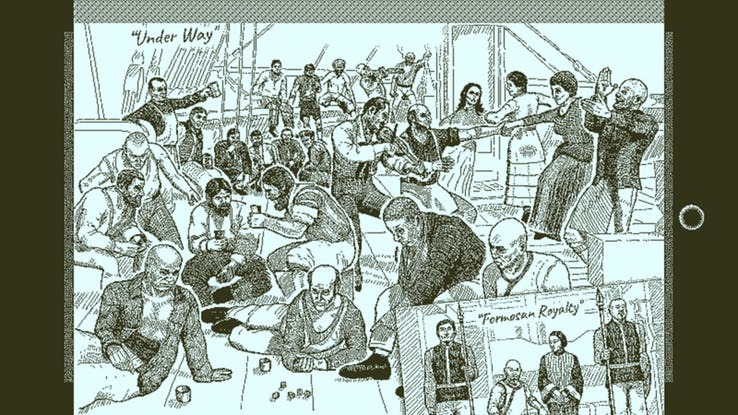 Except, in the case of the Obra Dinn, instead of the details of a fictional marching band, you need to uncover the identity of every person on the ship, how they died, and who killed them. The pocketwatch sequences are the centerpiece of the puzzle, giving you a static scene of the moment of death, the characters frozen in place, along with the sounds and dialogue that accompanied the person’s demise. You can walk around the frozen scene and examine details, using the book to help document what you discover and slowly eliminate possibilities from the list. It’s a bit like a scene from Sherlock or Hannibal, as you play the detective walking through the death scene, trying to tease out the key information lurking within. So the book is both a solving tool and the main body of the puzzle itself, a place for storing information, making guesses, and confirming when you have the correct chain of events for a given character’s death. The Obra Dinn is one giant, interconnected puzzle, built out of many little moments like this, and only when you’ve taken the time to examine all of it, exploring the ship and the crew from all angles, can you fill in the story of what happened. It’s essentially a murder mystery novel, but only the first chapter and the finale are in place; it is up to you as you piece together disparate fragments and assemble the narrative. In the end, it’s a simple story, but one told backward, forward, and out of order. Return of the Obra Dinn is the kind of storytelling that takes puzzles off the page and plants them smack-dab in the center of your imagination. And that’s pretty cool. If you’d like to try out the game for yourself, Return of the Obra Dinn is out now on PC and macOS for $19.99. This entry was posted in Games, PuzzleNation, Puzzles and tagged Brain teaser, computer game, first person, games, Geeking Out, Hannibal, logic problem, logic puzzle, murder mystery, mystery, obra dinn, papers, papers please, PC game, Please, Pop culture, PuzzleNation, Puzzlin' fool, return of the obra dinn, Sherlock, Sherlock Holmes by gmdirect. Bookmark the permalink.